Activate Coupon Save $10 to $300 off with instant coupon at Intuit.com. Choose from either the single-user license or three-user pack and save $100 per license for up to $300 off your order. For the single license, the sale price drops the price down o just $419.95. For the 3-user version, you’ll be able to pick it up for just $1099.95 (vs. the regular price of $1399.95). Just follow the above link and the sale price will be automatically activated to your order. Get $40 OFF Save up to $40.00/month on QuickBooks Accountant Plus 2015. If you’re considering QuickBooks Accountant Plus, then we have the best deal we’ve seen all year is now happening. Get up to $40.00 off your subscription ($480.00 off for the entire year) on the three-user version. Or you can save $14.00/month of you choose the 1-usre option. 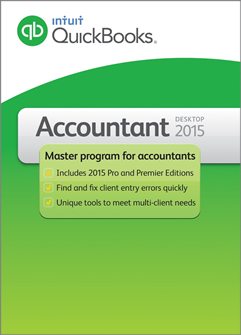 See All Deals Find QuickBooks Accountant 2015 on sale at Amazon. As one of Intuit’s top worldwide resellers, you can often find some of the best deals on the perpetual boxed versions of QuickBooks Accountant software. Sale prices tend to vary daily so see site for details but you’ll be hard pressed to find a better everyday sale price. Plus, you’ll enjoy free shipping (or instant download) on your order. Amazon is an authorized reseller of Intuit software so you’re backed by the same money back guarantee and support as you would be when ordering directly from the QuickBooks Store. Student Discount Take advantage of the student discount. Yes, we were also surprised to see that there is an available student discount on QuickBooks Accountant especially as all the other QuickBooks programs do not offer any special student pricing at all). You can now pick up the Quickbooks Accountant Student Edition for 70% off the list price of $499.95. So a single license comes out to be just $149.95. Of course academic verification is required that shouldn’t be difficult as long as you or a member of your household is currently enrolled in a full time university or K-12 school. Correct mistakes made while recording sales tax payments – bring up all transactions for a specific period of time; when you click on a name of the operation performed, it will display all transactions for that period; if some transactions don’t look correct, select them and reclassify them all at once to either the proper account or class. Write off invoices that cannot be collected – set you filter for the invoices you want to have displayed (age, to date, balance due less than, or transaction type) and you can write off invoices in batch rather than individually. Reclassify multiple transactions from a single location. Correct inventory discrepancies – troubleshoot inventory problems, create a list using different filters and review the item lists or inventory set up, you can also correct the inventory manually. The Review List Changes – this section permits analyzing and correcting Chart of Accounts, Items, Fixed Assets Items, or Payroll Items; it goes over the accounts added, changed, merged, or deleted since the last time data review was run and completed. Troubleshoot prior account balances – find differences between your records and the clients’ records; select the time range for which you want to see the information, and the software will display all accounts and balances as they appear on your and clients’ records; if there’s a difference, it will appear in a separate window; you can also select to see only the accounts with discrepancies. Fix unapplied vendor and customer payments and credits – on one screen you will have a list of payments received but unapplied to any invoice; right next to it there is a list of the open invoices; it is a faster and easier way to spot transactions that match but for some reason are not cancelled out. Handle Undeposited Funds in one window – in a side-by-side view match deposits to payments and fix transactions with a single click. Calendar view where you record all important events such as meetings, bills and tax payments due, or anything else you consider worthwhile; switch between daily, weekly, and monthly view for a snapshot of what’s to come; Calendar View also enlists coming events as well as missed or passed due. Handling many clients and documents might be overwhelming – Documents Center allows you to save together documents related to a particular transaction; import documents from your desktop or scan and drag and drop in the appropriate location. The new Lead Center is a place to store potential clients’ information; this sections can be customized to include information that you consider important; once a lead becomes a client it can be simply converted to appear in Customer Center without entering any more information. If you have several clients it’s very possible they use several versions of QuickBooks 2014; with QuickBooks Accountant you gain access to all QuickBooks versions so it’s irrelevant which one your client is using. You can create a copy of your clients QuickBooks file for a specific data range; The Period Copy will exclude any transactions that fall outside the range. Statement Writer gives you a choice to create customized financial reports for your clients; determine the layout, what information to include and for what period of time; this new report can be done for balance sheet, income statement, cover letter, or accrual basis accounting. Help a client get started by setting up his/her company from en existing company file using it as a template and then making the necessary adjustments. Accountant Center is your hub for the most commonly used tools.